Tackle essential landscaping jobs with a garden multi-tool. An adjustable, 180-degree rotating aluminum hinge lets you access the tool’s different functions and lets you get the just-right feeling when you’re at work. Hoe and slice, rake and smooth, scrape and cut, edge and chop, and aerate and loosen with a sharp steel blade and tines. Lightweight, durable, and stores upright. Dimensions: 61"x 4" x 7"
Frank’s solution makes it easy to switch between jobs without reaching for another tool. The smart and straightforward design is lightweight but durably built. Its quick-working functionality comes from a 180-degree aluminum rotating hinge. This is what lets you access the different functions on the tool head and it can also adjust to 14 different positions to give you the best-feeling fit. What can it tackle? 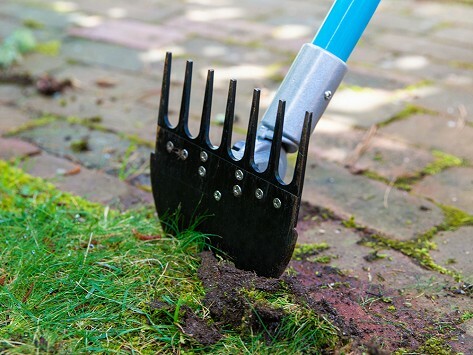 It works as a rake, hoe, scraper, edger, and aerator, to name a few. We think once you get your hands on it, you’ll end up using this hard-working tool for many types of yard jobs.